After trying dozens of others, I guarantee that this is the best meatloaf recipe you’ll find. It’s loaded with flavor, very easy to prepare, and the sauce totally makes it. 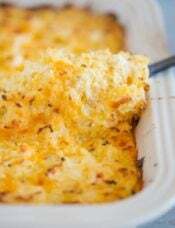 Serve it alongside your favorite mashed potatoes and veggies; it will be an instant hit every time you make it. I’ve talked a lot about Sunday dinners at my grandma’s house, where there was always an abundance of pasta and traditional Italian foods. However, we would often eat dinner at my grandma’s at random times throughout the week, as well. If she knew my parents were busy on a particular day, or happened to be making something she knew we’d like, she would call and tell us to come over. One of my favorite non-Italian meals that she made was meatloaf with mashed potatoes. It’s such a comfort food, and it reminds me of walking into her house on chilly fall and winter evenings, when it was already dark at dinnertime. Not long after my husband and I began dating, I found out that meatloaf was one of his favorite meals. It took me awhile, but I finally found a meatloaf recipe that we both love and that’s incredibly easy to make. Meatloaf seems like it should be such a simple recipe that there wouldn’t be much variation in terms of ingredients or process, but there are a few tricks that take it from ordinary meatloaf to the absolute best ever. I’ve found that one of the biggest mistakes you can make with meatloaf is to use only ground beef. 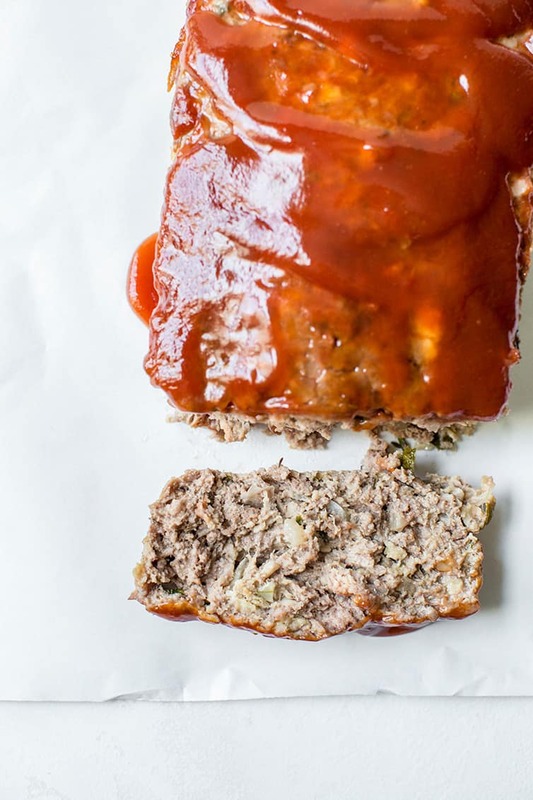 Your meatloaf will basically taste like a flavored, loaf-shaped hamburger. 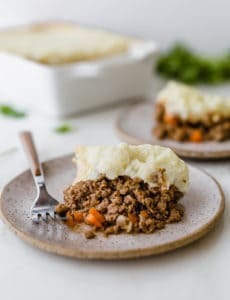 We want more depth of flavor and a more tender texture that doesn’t leave the meatloaf crumbly, so in addition to the ground beef, we use ground pork and ground veal. 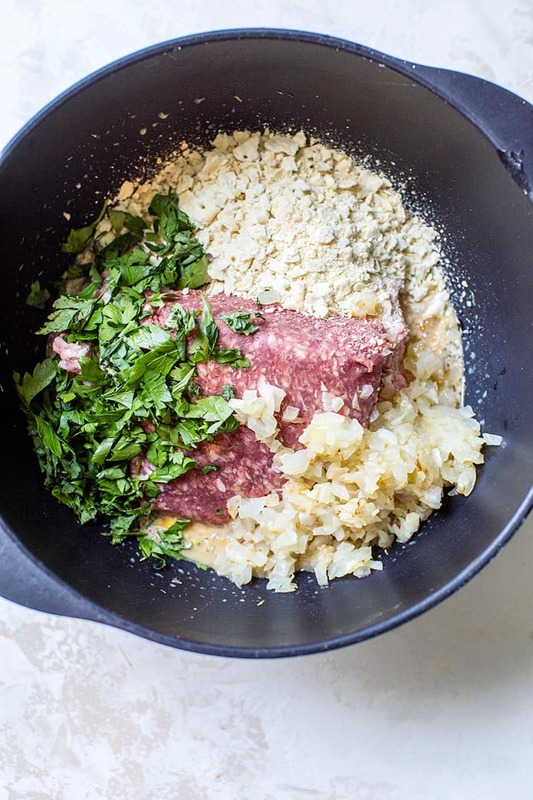 The Aromatics – Onion and garlic is sautéed before being added to the meatloaf mixture to enhance its flavor (and no one wants to bite into a raw piece of onion!). 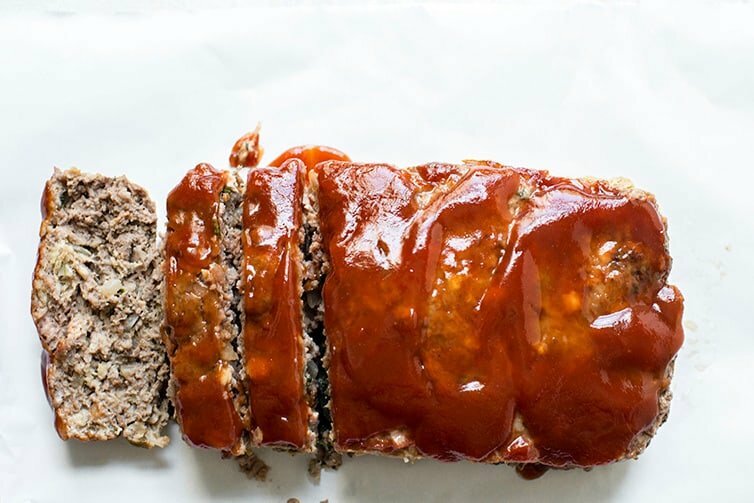 More Flavor – Dijon mustard, Worcestershire sauce, salt, black pepper, thyme, cayenne pepper, and parsley all give this meatloaf a massive oomph in the flavor department. Crushed saltine crackers – Lighten the texture the meatloaf, add moisture, as well as bind it together. (You can substitute ⅔ cup quick oats or 1⅓ cups fresh bread crumbs). The Glaze – This sauce is super simple but it packs tons of flavor and I would never make meatloaf without it! 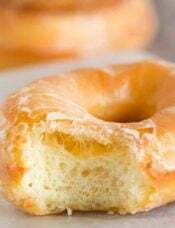 You only need three ingredients (ketchup, brown sugar and vinegar) for a perfect sweet and tangy glaze. Brush on half before baking, and the other half when it’s almost done in the oven. Making this meatloaf recipe is super simple! Once the onion and garlic are sauteed, you mix together all of the ingredients in a large bowl, either with a fork or your hands, taking care not to overmix (this keeps the meatloaf moist and tender; overmixing can cause it to because tough or dry). Then, either free form the loaf on a rimmed baking sheet that has been lined with aluminum foil (easy cleanup!) or you can put the mixture into a loaf pan with a perforated bottom). 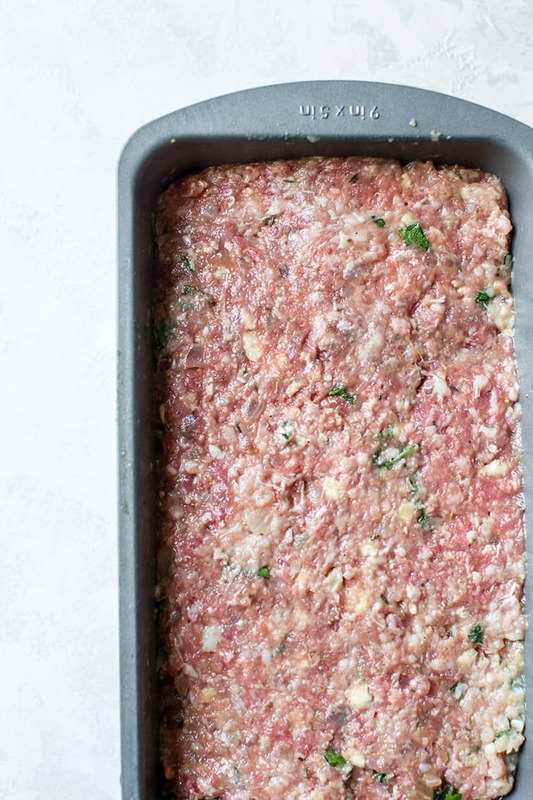 Freeze Before Baking – Mix together the ingredients, shape the meatloaf, then wrap in plastic wrap, place in a ziploc freezer bag and freeze for up to 4 months. Thaw overnight in the refrigerator, then bake as directed. I recommend freezing it without the glaze and making it/brushing it on right before baking. 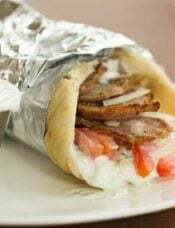 Freeze After Baking – After the meatloaf has been baked and cooled, wrap it in plastic wrap, then in a layer of aluminum foil, place in a ziploc freezer bag and freeze for up to 3 months. Thaw overnight in the refrigerator, then reheat in a 350-degree oven, covered with foil, for about 45 minutes, or until heated through. I do not recommend reheating directly from frozen, as it takes A LONG TIME and the outside can get dry while the inside remains frozen. I think it has the best texture when it is frozen raw, thawed and baked. Since it’s only baked once, it maintains the best flavor and texture. Without exception, I serve meatloaf with my favorite mashed potatoes; you can’t have meatloaf without the mashed potatoes as far as I’m concerned! This meatloaf is husband-approved and making it always reminds me of cozy dinners at my grandma’s house, so it’s a definite win-win for me. 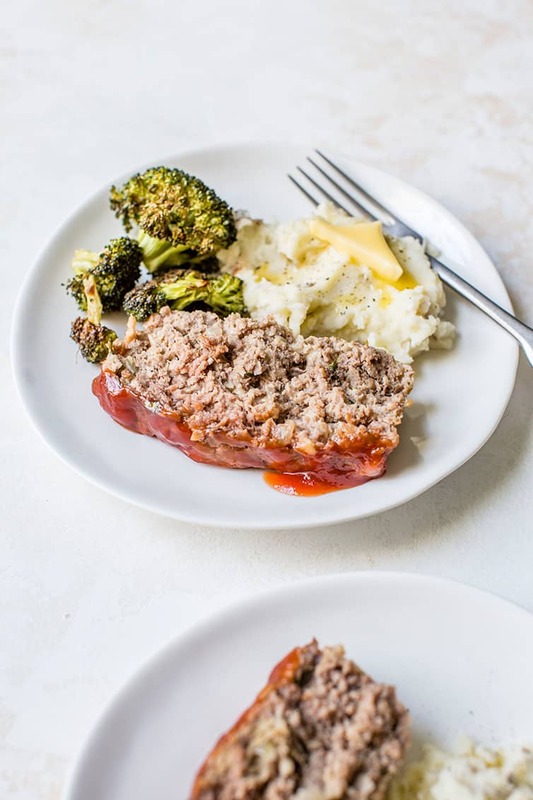 This classic meatloaf recipe is the absolute best you'll find. 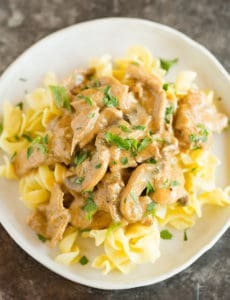 It's loaded with flavor, very easy to prepare, and the sauce is delicious. Make the Glaze: In a small saucepan, whisk together the ketchup, brown sugar and vinegar; set aside. Make the Meatloaf: Preheat oven to 350 degrees F. Heat oil in medium skillet over medium heat. Add the onion and garlic and sauté until softened, about 5 minutes. Set aside to cool while preparing the remaining ingredients. In a large bowl, whisk together the eggs, thyme, salt, pepper, mustard, Worcestershire sauce, cayenne and milk. 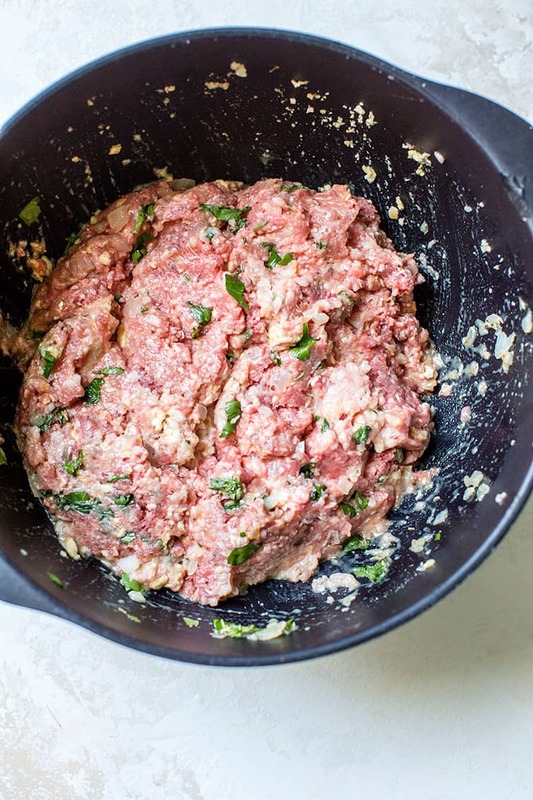 Add the ground meats, crackers, parsley and cooked onion mixture; mix with a fork until evenly blended. With wet hands, pat the mixture into a 9-by-5-inch loaf shape. Place on a foil-lined rimmed baking pan (you could also use a 9x5-inch loaf pan with a perforated bottom). Brush with half of the glaze. Bake meatloaf until it is cooked through (it should register 160 degrees F on an instant-read thermometer), about 1 hour, brushing with the remaining glaze when there is 15 minutes left. Cool at least 20 minutes, then slice the meatloaf and serve. The whole milk can be replaced by ½ cup plain yogurt. The crushed saltines can be replaced by ⅔ cup quick oats or 1⅓ cups fresh bread crumbs. Update Notes: This recipe was originally published in October 2014. 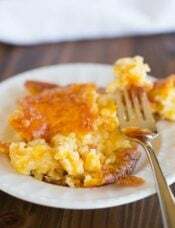 It was updated in September 2018 with new photos and extensive recipe tips. Mmm, we love meatloaf – I can’t wait to try this delicious recipe! Hello! I love this recipe and wondering if I can substitute panko crumbs for the saltines and if so, what would be the amount to use? I don’t want to use too many and the meatloaf dry out. Such a comfort meal for me! Looks delicious! I love this recipe. It’s the perfect meatloaf! Classic comfort food is a must for cooler weather. 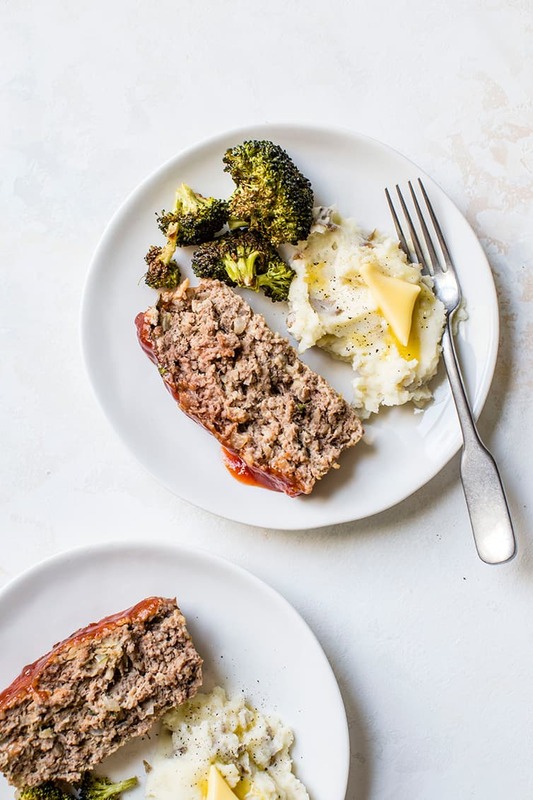 I am loving this simple meatloaf for any night of the week. I tried your meatloaf recipe this weekend, the meatloaf part was delish but question the use of 4 tsp of cider vinegar in the glaze, it made the glaze very sour and I would not use it again. I make a glaze using ketchup, brown sugar and dried mustard powder which is very good. Thanks. Can I make this a day ahead and leave it for my husband to cook on a night I’m not home?? Will the ingredients hold up uncooked, but mixed together overnight?? Hi Ellie, I think that would work just fine. Hi Michelle! I’m not fond of mustard, so should I use 1 tsp or 2 tsp of dry mustard? Wow! Your kids are growing up so fast! Joseph looks so grown up in his school picture. Lol. As always I love the pictures of the goldens too. Have a great week! My husband actually HATES mustard and doesn’t taste it at all in this meatloaf, so I think it would be okay! I love meatloaf and mashed potatoes but the best thing is meatloaf sandwiches the next day. I lived most of my life in a small city (pop 23,000). Meatloaf mix was available in every grocery. I moved to a large city (greater metropolitan population over a million). Meatloaf mix is impossible to find! I’ve had butchers look totally confused when I asked for it. I use half ground beef and half ground pork..
I’ve used oats, cracker crumbs or bread crumbs for the starch. 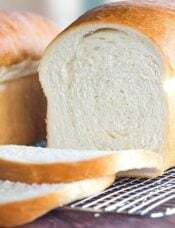 Now I tend to use two slices of good quality sandwich bread (such as Arnold Country Classics White Bread or Pepperidge Farm Farmhouse Hearty White Bread), crusts removed, soaked in a little milk, then wrung out and added to the meat mixture. I think it gives the best texture. I laughed when I read your comment that meatloaf made with all ground beef will taste like a big hamburger. I think that hamburgers made with too much added stuff tastes like meatloaf on a bun. I want to ask you if i can use a regular loaf tin. In my country there are none perforated bottem loaf tins! And i love the shape of a loaf tin. I’ve all different sizes as wel in regular materials as silicone ones. I like to use one of these, but they’re not perforated. What can i do besides usung a baking try wich i don’t want! Thanks in advance for looking into my question. I hope to hear from you. About your recipe….it sounds scrumptious, i’d like a piece of it right now, mayby even more than only one piece! 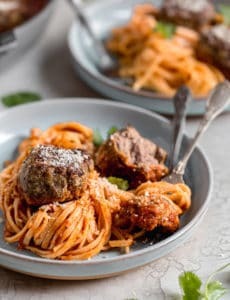 I’ve heard it be4…about the 3 different types of meat for meatloaf or meatballs and i’m starting to believe they were right all along! But this is new and not seen be4 in my country, just as a perforated loaf tin, but that’s gonna change. I’ll tell all my friends about it and hope they tell their friends and so on. In case you wonder where i’m from….i’m from the Netherlands, Europe. Well…i Thank you for the recipe and hope you’ve an answer to my question. Hi Marja, If you use a pan without a perforated bottom, the fat will collect at the bottom and it will become soggy. I know many people who do it, but the texture and flavor won’t be quite as good. I’d like to try this meatloaf – looks so good! Wanted to use fresh bread crumbs instead of the saltines – about how many pieces of bread would this be? And you just tear up the bread? Also, can I make this without the glaze? Thank you! Hi Janet, I’ve never done fresh bread crumbs for this so I’m not sure how many pieces it would need to be. And yes you could make it without the glaze but it’s sooooooo much better with it! I use 2 pieces of bread. Soak the pieces in the milk and egg mixture.. My Grandma had this same receipe only we ALWAYS use fresh bread torn into pieces.. I have never made anything from your site that wasn’t a hit…and this was another success!!! My husband (the pickiest eater ever) RAVED about this. Thank you! Thank you! Perfect football Sunday comfort food! I have made this meatloaf previously. Loved the meatloaf, but the glaze, was good enough that I could have eaten it by the spoonful. I use the BJ’s meatloaf mix. Tonight I am baking another one despite the hot weather. We enjoy it as sandwiches and will eat it cold w some salad for dinner. Then I’m planning to make either strawberry sorbet or sherbet. I have never made anything from this web site that wasn’t loved by all. That’s for some great food. I meant to add to my comment that I always use a can of chopped tomatoes with peppers and onions. I use bread crumbs, not oatmeal. The tomatoes and green peppers make the meat loaf!! It’s not a meatloaf unless it has a chopped bell pepper in it….my Mother always put it in hers and the smell was wonderful!! I also put several strips of bacon on the top of mine, too. This sounds so good!! I buy a mix of the 3 meats at BJ’s. It is perfect for this meal. I didn’t have enough saltines, so I used oats as well. I am not sure which I liked better, the glaze or the meat. I tasted the glaze as I was cooking it. It is great. However, I would suggest that you triple the glaze recipe if you want to add some glaze to the individual plates. Barely enough to glaze the meat. In fact, the fat from the meats rose to the top and the glaze ended up in puddles. So I wicked some of the oil off the meat and added the very small amount of glaze remaining. Tonight, I am tripling the glaze recipe. Thanks for such a great recipe. It will be on our menu frequently. This meatloaf looks delicious but I’m wondering if the overall taste or quality will be affected if the saltines are omitted? We are trying to limit the amount of processed/refined carbs in our diet. The meatloaf will need something to soak up the wet ingredients and create the right texture. Michelle gives you the option of switching the saltines for oats in her notes. Hi Jennifer, Yes, you need to have some sort of starch to absorb the liquid. Please see the notes at the end of the recipe for using oats or fresh bread crumbs. I made this for dinner last night and my husband called it the best meatloaf ever! We both loved it. I even used ground turkey and it was delicious. Definitely a keeper! Funny, I just gave my granddaughter my meatloaf recipe yesterday then I saw this, I forwarded it to her this morning, sounds great and I’m going to try it. I use Ritz crackers in mine instead of the saltines. I use a 9″X13″ baking dish and smother the meatloaf in mashed potatoes. Thanks for all your recipe’s. Michelle, once again one of your recipes helped me make our guests (family of 7) very happy. 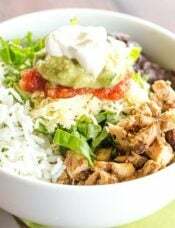 Thank you for this easy-to-make and very flavorful recipe! I could only get ground beef since it was short notice, but the seasonings and the wonderful glaze made it VERY tasty. Your recipes have never, ever, ever let me down. How do you do it? Every.Single.Time.??? Thanks for all your hard work — and now even with your precious baby! Yum! We’ve made this twice (the first time I bought double the amount of meat so that I could freeze half and make another meatloaf later). I actually craved this meatloaf for days after we finished it the first time. The second time we stuffed peppers with the meatloaf. Phenomenal recipe with great flavor! Oops! How rude of me. I forgot to say thankyou… so thankyou! Is that sixteen individual squares of Saltines? P.S… I’m also a BEB, and yours is definitely my favourite and most used blog! Big pat to Einstein and Duke for me!